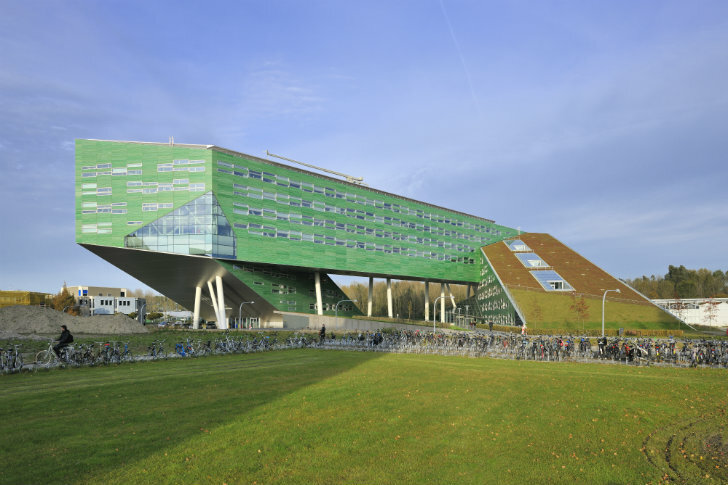 Linnaeusborg at the University of Groningen is a green building - literally. Not only is it colored green, but it has a green roof and features energy-efficient, smart, future-proof design. This zig-zagging horizontal tower is the new building for the Centre for Life Sciences of the Faculty of Mathematics and Natural Sciences at the University, which is located in the northern Netherlands. 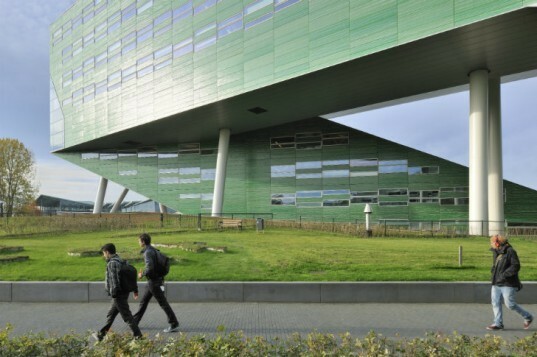 Designed by Rudy Uytenhaak Architectenbureau, the life sciences building holds space for laboratories, greenhouses, animal housing, offices, and classrooms all dedicated to biology, zoology, botany, microbiology, and biotechnology. Built around the principles of interaction, dynamism, and flexibility, Linnaeusborg is a high-tech facility with a decidedly green twist. Linnaeusborg is the facility for the Centre for Life Sciences at the University of Groningen and was designed by Rudy Uytenhaak Architectenbureau. Situated on the eastern side of the campus, the building abuts a moat and a nature area. Greenhouses and gardening test beds sit on the south, and animal housing sits on the north. Formed from two ascending ramps and connected by a bridge, one looks through the building rather than at it. Being a facility dedicated to natural sciences, its form accentuates nature, encourages use of the grounds, and makes extra green space on the sloping green roof. The nine story building includes space for three research and training centers, specialized biochemical labs, MRI, isotope lab, animal facilities, aquaria, and greenhouses. Inside, the building was arranged to have a flexible, future-proof layout that would allow easy modifications and alterations over the years as the department grew or altered research paths. This ensures that the building will be useful for the long term. A narrow floor plate, skylights and atriums pull in natural daylight throughout the entire building, while the inner circulation encourages communication, activity and chance meetings amongst staff. Use of more sustainable materials and energy efficient design top off its eco credentials. Concrete core activation connected to heat and cold storage facilities provide energy efficient climate control. A light weight, low-maintenance facade made from prefabricated polyester wall elements helped save on construction costs and provides a high insulation value. Linnaeusborg is the facility for the Centre for Life Sciences at the University of Groningen and was designed by Rudy Uytenhaak Architectenbureau. Situated on the eastern side of the Zernike College campus, the building abuts a moat and a nature area. Greenhouses and gardening test beds sit on the south and animal housing sits on the north. Formed from two ascending ramps and connected by a bridge, one looks through the building rather than at it. Being a facility dedicated to natural sciences, its form accentuates nature, encourages use of the grounds and makes extra green space on the sloping green roof. Inside, the building was arranged to have a flexible, future proof layout that would allow easy modifications and alterations over the years as the department grew or altered research paths. This ensures that the building will be useful for the long term. A narrow floor plate, skylights and atriums pull in natural daylight throughout the entire building, while the inner circulation encourages communication, activity and chance meetings amongst staff. Use of more sustainable materials and energy efficient design top off its eco credentials. Concrete core activation connected to heat and cold storage facilities provide energy efficient climate control. A light weight, low-maintenance facade made from prefabricated polyester wall elements helped save on construction costs and provides a high insulation value. The nine story building includes space for three research and lab, animal facilities, aquaria and green houses. The project commenced in 2007 and was completed in June 2010.